Why Does Gateway Church Charge for Entertainment and Pizza? One of the arguments I often hear in favor of megachurches is that they offer so much more than a small church can. They have programs for every age and with all of the tithe money, they can create larger events involving more people for a larger impact. If that is true, then why charge for these events? Why not take in all of that money and then pay to give away the Gospel? 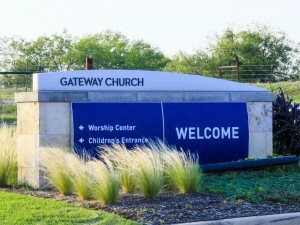 Let me take Gateway Church as a case in point. Gateway Church took in about $139-million in 2016. By any measure, that is a substantial level of giving by those who believe in church. However, Gateway’s policy is to charge a fee to youth group members for their pizza at youth meetings. Members are asked to give more money to help students who can’t pay the fee. I don’t understand this from a church which takes in $139-million. 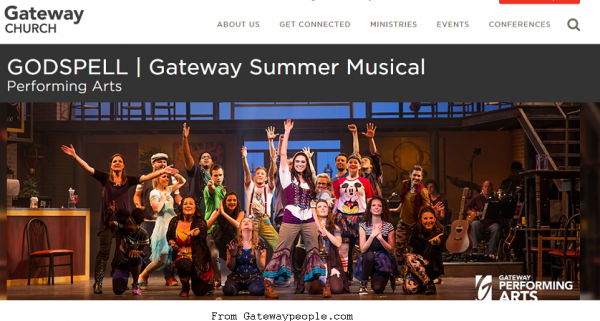 Currently, Gateway Church is putting on Godspell as their summer musical production. However, tithing isn’t enough to get you a ticket. You have to pay from $10 to $26 for admission to the church to see the play. In addition to giving your creative members something to do, this could be viewed as a community outreach. However, why couldn’t this be free to the public? Isn’t that what the funds are supposed to go for? Outreach? There is another show I will mention but I do so not knowing if the show is a Gateway event or a Michael Jr. event (what does “organized by Gateway Church” mean?). Michael Jr. is a professional comedian who attends Gateway Church. He is planning a show at the church in September with admission prices ranging from $20 to $35. He also has some kind of formal relationship with the church and has given performances for free in the past. Perhaps, Gateway’s financial problems are worse than they are letting on. If I was a giving unit at Gateway, I would wonder what is up. The church has funds to sponsor an inaugural gala but not a summer musical or pizza for youth group kids. I suppose the gala is one of those things that a small church can’t do, but then I don’t understand why any church should do that. Consider the title an open question. Readers, let me know what I am missing. Perhaps Gateway is wisely spending the funds on lots of ministry. If so, it would be good for Gateway to open the books and let the members know where the funds are going. Mars Hill Church resisted that until the bitter end. It would be a shame if Gateway failed to learn from that situation. Author Warren ThrockmortonPosted on July 30, 2017 Categories Gateway Church, Robert MorrisTags Gateway Church, Godspell, Michael Jr., pizza, Robert MorrisLeave a comment on Why Does Gateway Church Charge for Entertainment and Pizza?